In the mayhem of World War Two, Mira Adanja was born in Budapest in August 1942. Mira’s parents – father, Dr. Solomon Adanja, and mother, Katarina nee Baruch -, had fled from occupied Belgrade to Hungary to escape the Fascist persecution of Jews. The anti-Jewish front was spreading like fire throughout vanquished Europe. When Hungary also became unsafe for Jews, the Adanja family sought refuge in Subotica with Katarina’s parents, Olga and Aladar Baruch. The police authorities in Subotica kept their son-in-law, Solomon, under constant surveillance. Katarina also felt the brunt of the Hungarian police harassment while the threat of being banished by the occupying authorities back to Belgrade was ever present. A return to Belgrade meant only one thing: death. In all likelihood the family would be taken to the Sajmište death camp where the majority of Belgrade Jews had ended up and been killed. When in spring 1944 Germany invaded Hungary, an unsurpassed persecution of tens of thousands of Jews began. In Subotica, still formally under Hungarian protectorate, concurrent preparations were under way for the deportation of Jews to death camps. To reach a decision how to save one’s life did not come by reason alone. The Baruchs and Adanjas decision what to do next was dictated by uncertainty and harsh reality. In the end, the “family council” resolved by common consent that Solomon and Katarina should return to Budapest. In their “joint” opinion it would be much easier to hide in a big city where Solomon and Katarina had relatives and friends, despite the ongoing persecution of Jews. The eighteen-month-old Mira was left in Subotica with her grandmother, Olga, and grandfather, Aladar. Lujza Vlahović, a manicurist, was a frequent visitor of the Baruchs. They had known each other for a long time and the initial, strictly professional relationship had over the years turned into a true friendship. She lived alone, in a cul-de-sac removed from the city centre of Subotica. Among the town folk she was looked on as a generous and honest person. Lujza herself was fully aware of what lay in store for the Jews. She was a Croat and therefore not directly threatened by the occupying authorities. 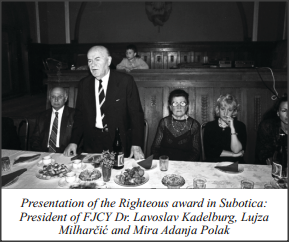 Lujza offered to take Mira into her home when the ghetto was formed in Subotica in the spring of 1944 and the Baruchs, together with other Jews, were being forced to leave their home. Caught unprepared, the Baruchs did not, at first, know how to react. Their reservations about Lujza tending to the small child sprang from the fact that she had had no children of her own, and that at an age of over sixty, Lujza would be a novice. However, there was not much time for deliberation; they too, were already destined for the ghetto. Uncertain of the fate that awaited them, they agreed that Mira should temporarily move in with Lujza. Whether this decision was rushed by the three of them, would only be known after a trial period. Grandmother Olga and grandfather Aladar were never to know if their infant granddaughter had adapted to her new living conditions. They were soon taken from the ghetto and deported by way of Hungary to the Auschwitz death camp. The enemy authorities knew that the toddler Mira had been staying with her grandparents and that the child was not with them at the time of transport. A search was instigated throughout town for the grandchild of one of Subotica’s wealthiest Jews. Apart from Mira, they were also looking for other Jews who had managed to evade the last transport. These hunt downs were a daily affair notwithstanding the approaching end of the war. Lujza told her inquisitive neighbours that the child she had taken in was from Budapest. The child’s parents, her relatives, believed that she would be much safer in a small town considering the constant bombardment of the city. Whether the neighbours believed Lujza’s story, was hard to say. In any case, not one of them informed that a child, Mira, was hiding in Lujza’s humble house. On one occasion a raid was initiated starting with the school which was only some hundred metres away from Lujza’s house. Fortunately, the police did not venture into the out-of-the-way blind alley. Since word of imminent raids nearly always turned out to be true, Lujza was often forced to seek refuge on the farm of her friend, Grga. Once the raids were over, Lujza would return home with Mira. The frequent flights to nearby farmsteads were explained to the neighbours by a deficiency of milk necessary for Mira’s nutrition and the general lack of food harassing Subotica. Lujza took care of Mira like any mother would. Fear for herself never came close to the one she felt for Mira’s wellbeing, although if caught out, she and the child would equally face mortal danger. Ridden with dread and uncertainty, they welcomed the end of war. Subotica was liberated on October 10th, 1944. Quite understandably, it was not to be known for some time who had survived the horrors of war. In the months that followed none of Mira’s relatives appeared in Subotica. Lujza had already begun to look on Mira as her own daughter when her parents returned from Budapest. In spite of the parents’ heartfelt joy, they could not make contact with their daughter. Mira spoke Hungarian and her parents Serbian. Solomon and Katarina agreed with Lujza that Mira should stay with her for a little longer until the Adanjas could find their way round Belgrade, which they had left four years earlier. During that period Lujza prepared Mira for the reunion with her parents. Over time spent with Lujza, Mira had learned to call her saviour “mamma Lujza” to distinguish her from her natural mother. However, from then on, not only for Mira, but for the entire Adanja family, counting the two children born after the war, Lujza became and remained “mamma Lujza”.